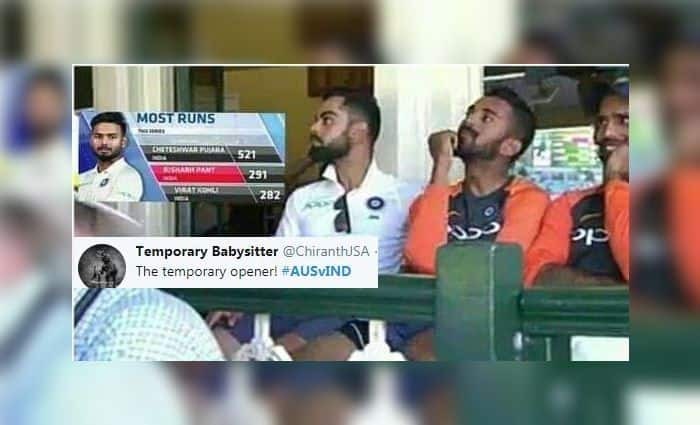 India vs Australia 4th Test Sydney: India opener KL Rahul has been woefully out-of-form and a picture of him along with India captain Virat Kohli has become a viral meme as Twitterverse is having a lot of fun creating funny captions over it. India vs Australia 4th Test Sydney: India opener KL Rahul has been woefully out-of-form and a picture of him along with India captain Virat Kohli has become a viral meme as Twitterverse is having a lot of fun creating funny captions over it. It is a picture where the graphic on the television shows the most runs scored in the series, where Cheteshwar Pujara at the numero uno spot and he is surprisingly followed by Rishabh Pant, who went past India captain Virat Kohli. KL Rahul has amassed 57 runs in his five outings in Australia, and his average is a paltry 11.4, way less than what is expected of him. Netizens are commentating on KL Rahul’s expression when the stat pops up on television while they are in the dressing room. Meanwhile, thanks to Pujara’s 193 and Pant’s 159* India are in the box seat in the ongoing Sydney Test and by the looks of it, it seems that the visitors have batted out the hosts. It would be interesting to see if the bowlers who have performed consistently well in the series can get India the 20 wickets that is required to win the Sydney Test and clinch the coveted Border-Gavaskar Trophy 3-1.